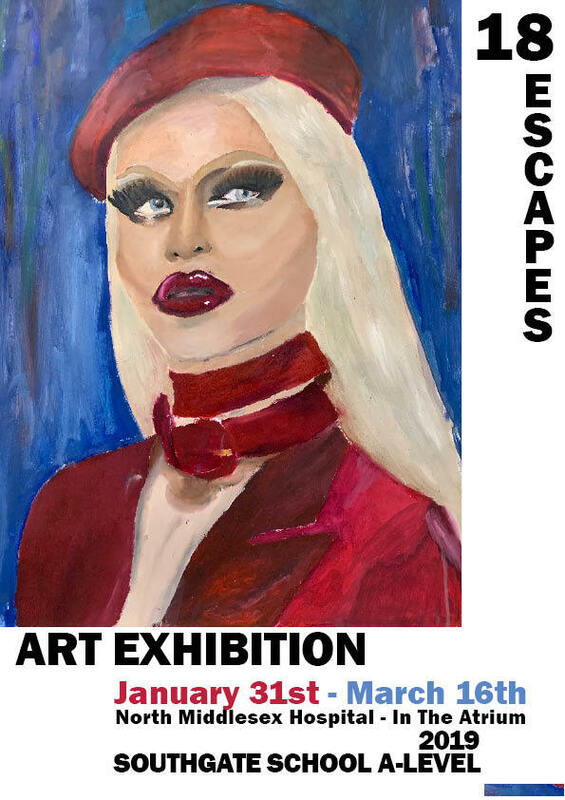 A-level students from Southgate School have teamed up for the second year in a row with North Middlesex University Hospital NHS Trust to launch an art exhibition on the theme of mental health. The Art Show in the Atrium, of over a dozen works produced by 17 -19 year-old students, opens on Thursday 31 January in the Edmonton hospital’s main atrium and will be on display for six weeks until 16 March. Around 30 students, teachers, parents and guests will attend a “private viewing” of the exhibition, on the theme of mental health, from 12.00-1.00pm on Thursday 31 January. The exhibition explores aspects of emotional and mental health. The works include figurative and abstract works, portraiture and symbolism and uses a range of mixed media, mono-prints, images of expressive faces, urban landscapes and symbolic fruit combined to reflect the students’ own personal understanding of mental wellbeing. Student Alex aged 17, whose assertive portrait illustrates the importance of raising awareness on gender identity is featured in the exhibition’s promotional posters, said: “This experience of exhibiting my own work, expressing personal ideas and engaging with a diverse audience feels as though it’s just the start of an exciting career within the arts. We all really appreciate the opportunity”. The launch event will include a drawing workshop by sixth formers from the school in Sussex Way, Cockfosters.